The world's least impressive superhero might get his own movie, provided that cost isn't too high. Aquaman has something of an image problem. It's not that his powers are bad, it's just that they only tend to be useful in very specific situations. Put him underwater and he's super-strong, fast as anything and can communicate telepathically with all the denizens of the deep, but put him on land, and he's almost a liability. You might think that no one would really want to make an Aquaman movie, but according to Alan Ritchson, who plays the character on TV show Smallville, nothing could be further from the truth. 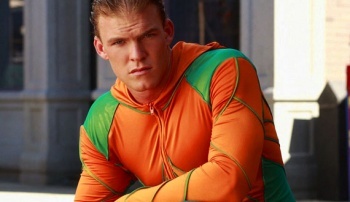 Ritchson said that although he'd had to deal with a fair amount of scorn for playing Aquaman, he'd observed an increase in the character's popularity. He said that Hollywood was investigating the possibility of an Aquaman movie, although no one had approached him about it yet, so he didn't know very many details. He thought that the primary obstacle to getting the movie made would be the cost of making a film set mainly underwater. This actually won't be the first time that Aquaman has been shoved into the limelight in recent years, as back in 2006, the creators of Smallville made a pilot for an Aquaman TV show. The CW opted not to buy the show, but it was made available on iTunes, where it quickly became one of the most downloaded shows on the service. Despite the relative success of this TV pilot, I'd be surprised if anyone makes an Aquaman movie any time soon. It's one thing to invest the kind of money it takes to make a TV show, but a movie is a very different deal altogether. Aquaman has made a number of cameos in various cartoon shows, and even had his own show in the late 60s, but he has nowhere near the level of recognition as the likes of Superman or Batman, and what you can do with him is more limited because of the nature of his powers. Still, if Green Lantern - which is in a similar situation as Aquaman, in that people aren't overly familiar with the character - does well, it might open the door for the lesser known DC superheroes on the big screen.